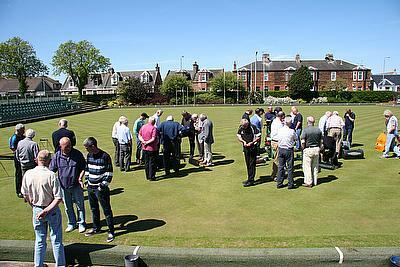 Bowls Scotland is the national governing body for outdoor lawn bowls in Scotland and currently has 882 member clubs and 65,000 individual members. The organisation is committed to providing its members with education and support on different aspects including club development, membership recruitment, club governance, coaching, green maintenance and how to source funding. 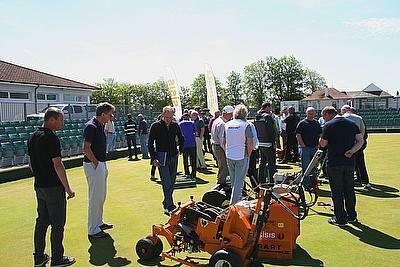 The Green Maintenance and Improvement Seminar series, which saw Bowls Scotland working in partnership with Dennis and SISIS, Greentech Sportsturf and Henderson Grass Machinery, brought together over two hundred greenkeeping enthusiasts at a number of venues in Scotland including Newhills Bowling Club in Aberdeen, Currie Bowling Club in Edinburgh, Parkview Bowling Club in Angus, Newton Park Bowling Club in Ayr and Woodend Bowling Club in Glasgow. Robert Christie, Director of Development for Bowls Scotland started proceedings with a warm welcome before outlining the aims and strategy of the seminar. Val Wright, Coach and Education Officer for Bowls Scotland took to the stage next to discuss grants and funding before outdoor practical sessions ensued. Andy Walker, Field Support Manager, and Ewen Wilson, Northern Area Sales manager for Dennis and SISIS were on hand to demonstrate modern greens maintenance methods using a range of turf maintenance equipment and providing invaluable advice on how to get the very best out of your mower. A hearty complimentary lunch signalled the halfway point for the day before Scott McNeil from Henderson Grass Machinery, presented a real-life case study of how his bowling club was able to improve the quality of its green and explained the methods they used to achieve it. Greentech Sportsturf’s Neil Mitchell then provided information on how to get the best value and best results from inputs such as fertilisers, fungicides, pesticides and grass seed. The seminars were concluded with an open question and answer session where all delegates had the opportunity to ask any pressing questions relating to their own situations. Commenting on the success of the seminars, Bowls Scotland’s Val Wright said: “A lot of clubs spend a vast amount of money on maintaining their greens, so our members have come to these seminars to find out more information on how they can improve the greens that they are looking after. “I would highly recommend attending a seminar like this because there is a variety of information that has been made available to us which will support the running of our club. It will also assist with the development of the club and give us the opportunity to obtain grants for a number of projects we have in the offing. We are looking forward to going back to our committee and passing that information on,” he said. After completing the successful series of seminars, Director of Development Robert Christie was upbeat about how beneficial the partnership between Bowls Scotland, Dennis and SISIS and all the partners could be to the sport. “Dennis and SISIS are one of the leaders in the industry in giving information and advice to bowling clubs in terms of green maintenance. The partnership has really developed over time and they’ve supported us at the National Championships for the last couple of years.